Fourth in the table. Four points shy of top spot. Beaten just twice in 19 games. Top-scorers in the division. 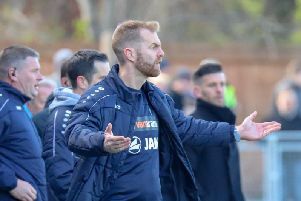 Harrogate Town's first ever season playing in English football's fifth tier isn't progressing too badly. Despite a slight dip in form in recent weeks, Simon Weaver's team - table-toppers for a good chunk of September - are still very much in the title race, despite only having been promoted to the National League at the end of last term. With around a third of the season already gone, an inspection of Town’s vital statistics reveals that their firepower is their greatest strength. The creativity of left-winger Joe Leesley is, not for the first time, proving crucial to the Wetherby Road outfit's good form. He has already provided 13 assists in just 17 starts to date, earning himself five Harrogate Advertiser Star Man awards. Jack Muldoon is the club's top-scorer with seven goals in 21 appearances, Dominic Knowles has five in 13 games, Aaron Williams five in 19 (only eight of which were starts), Callum Howe five in 20 and Mark Beck three in 16. At the other end of the field, goalkeeper James Belshaw has managed eight clean-sheets in 21 matches, producing a catalogue of stunning saves along the way. Town have conceded 22 times in their 19 National League fixtures, a statistic bettered by eight of their rivals in the division. Centre-half Callum Howe has been chosen as the Advertiser's man of the match on five occasions thus far, leaving him neck-and-neck with Leesley. Gloveman Belshaw's MOM tally stands at four, skipper Josh Falkingham has three and Muldoon and Kelvin Langmead two apiece. Town have scored first in eight of their 19 league outings, going on to win all of those matches bar one, the 2-2 home draw with Dover Athletic on October 13. They have salvaged an impressive 17 points from losing positions, finding the back of the net after the 85th minute to alter the outcome of a game on five occasions. Nineteen of their 37 points have been won at the CNG Stadium, while 18 have come on the road. Four Town players, Belshaw, Muldoon, Warren Burrell and Liam Kitching have featured in every single match.